Andy Warhol, on the other hand, is considered to be the ultimate symbol of Pop. His early paintings presented mass-produced consumer goods (think back to his famous Campbell’s Soup paintings), while his later art evolved into mass produced objects in and of themselves, as he applied a factory-like, assembly-line method of production to his silkscreens, which treat such topics as consumer culture, fame (or infamy) and celebrity. Wyeth was an introverted, enigmatic character, while Warhol was transformed into a symbol of the New York social scene with his Factory entourage and was revered as a popular culture sensation. Invitation to to the 1976 exhibition “Andy Warhol and Jamie Wyeth Portraits of Each Other” at the Coe Kerr Gallery– Hirshhorn Museum and Sculpture Garden Library. 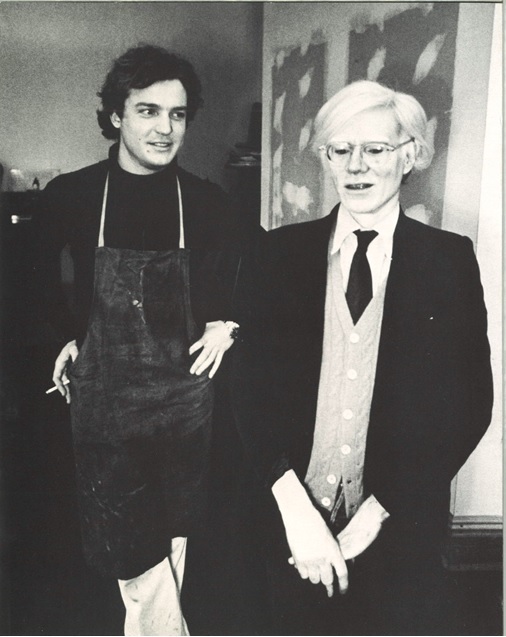 This mutual interest in the other’s work resulted in a portrait-exchange between the two artists in 1975. 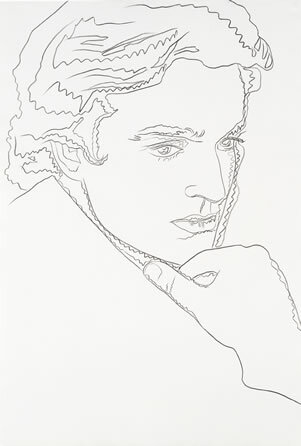 The outcome of this collaboration, a collection of portraits and studies that were completed in each artist’s signature style and technique, was exhibited at the Coe Kerr Gallery in 1976. An invitation for this unusual paring was found in the Art and Artist Files at the Hirshhorn Museum and Sculpture Garden Library and helps document this partnership. In the exhibit, Warhol, the “Patriarch of Pop,” is presented in a hyper-naturalistic manner, with imperfect, blemished skin, disheveled hair, and an expression that seems to suggest that he was abruptly taken by surprise. By the 1970s there was a wealth of images of Warhol circulating, making his carefully constructed image instantly recognizable to all. However, Wyeth seems to have captured a side to Warhol previously unseen that almost shockingly contrasts other representations of the most famous man in the art world. 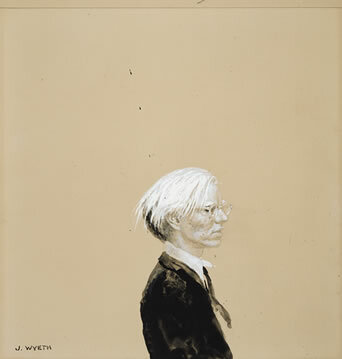 On the other hand, Warhol transforms Wyeth, a rural kid from Wilmington, Delaware, who perfected his technique by painting farm animals and landscapes, into a sort of pop star. Wyeth’s pose evokes a sense of self-possessed confidence immortalized for all time into the ranks of Warhol’s other portraits of Mick Jagger, Elizabeth Taylor and John Lennon. Two examples of this collaboration form part of the National Portrait Gallery’s permanent collection. The works are studies by each artist, which reveal how the final products were developed. Elliot Bostwick Davis, ed. Jamie Wyeth. Boston : MFA Publications, 2014. Next Post Tired of Poinsettias? Bah, Humbug! Sadly, the links on this page are broken. But what an interesting thing for both of these great men to have done when they were young. Bravo! Now, if we could only view the resulting artwork. Please resend. 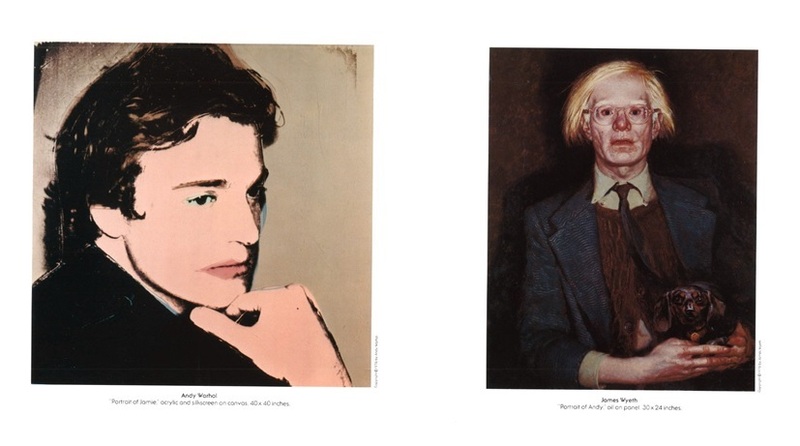 The image of Jamie Wyeth by Andy Warhol did not come through, only a blank space where it should have been. Are both portraits presently on view at the Natl Portrait Gallery? We’ll investigate why the images aren’t displaying for certain viewers – thanks for mentioning that!